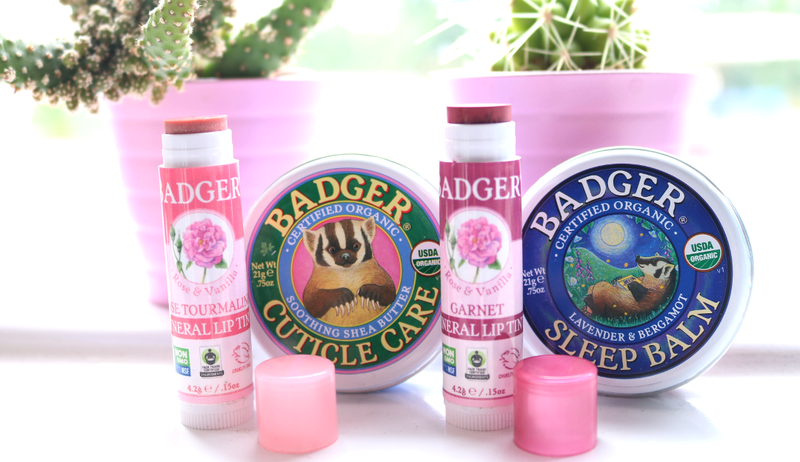 Badger Balm is a popular natural and organic skincare brand that I often see pop up on many of the green beauty blogs that I follow. They have a whole range of brilliant balmy type products, as well as sunscreens, and with their adorable packaging, I just had to include them in my Introducing series for anyone who hasn't come across them before! Like many successful business ideas, Badger Balm was created when founder Bill Whyte was looking for a natural product to use on his weather-worn hands which always cracked during the bitterly cold winters in New England, USA. After trying various remedies, he finally struck upon the idea of blending Beeswax with Olive Oil, which resulted in the first Badger Balm product back in 1994. Since then, this family-owned company has developed several different types of balms that heal and moisturise a variety of skin concerns, alongside aromatherapy based balms and more recently, natural sunscreens and tinted lip balms. I was kindly sent two of these newly reformulated Mineral Lip Tints to try out, which arrived with two of their popular balm products. Tinted lip balms are something that I seem to use more and more of these days, and the main reason is because they are just so low maintenance and easy to use! These zero fuss, twist-up sticks can be thrown into any purse/handbag/suitcase and within seconds, you can simply swipe them on and get a nice wash of colour on your lips without having to get a mirror or lip liner out. 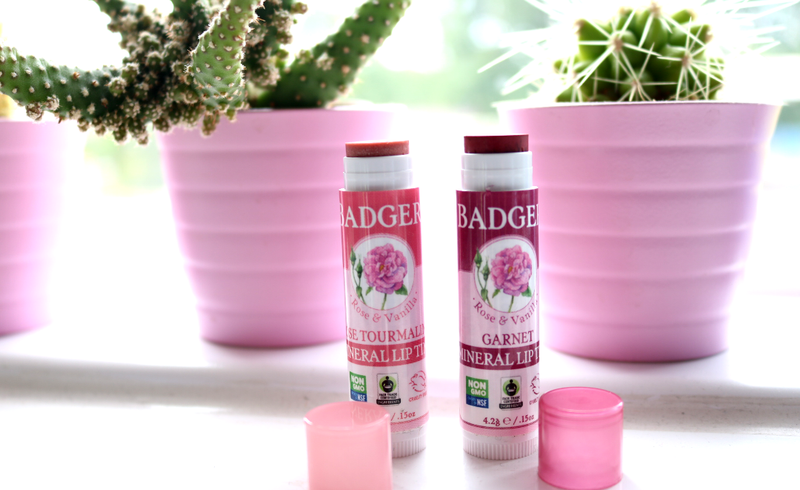 The Badger Mineral Lip Tints come in a range of colours and I received Rose Tourmaline (a subtle hint of pink), and Garnet (a deeper plum-red hue that gives off a 'just bitten into a cherry' vibe). Both are incredibly moisturising and creamy thanks to a blend of Beeswax, Olive Oil, Cocoa Butter, Coconut Oil and Shea Butter, and they have a slightly sweet but floral sort of flavour to them. Perfect for Summer when you want to keep your look light and fresh! 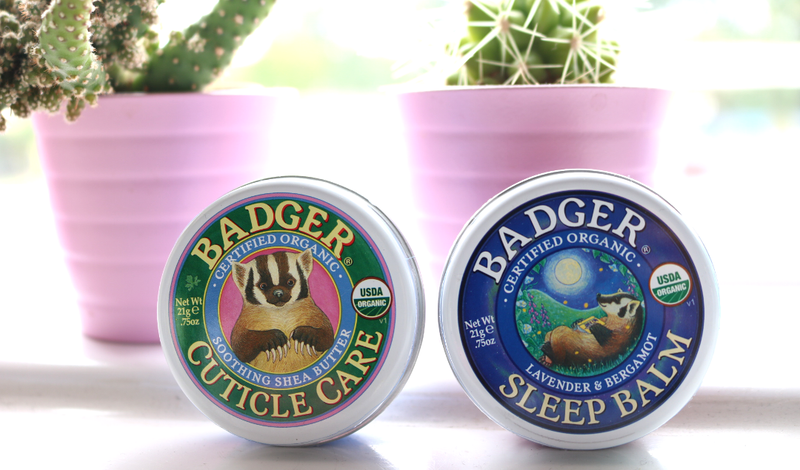 Two bestsellers from Badger are the Cuticle Care and Sleep Balm. Packaged in their iconic round tins (available in mini and larger sizes - the 21g mini tins are shown above) that feature the brand's adorable mascot, it's easy to see why they are so popular from the minute that you try them. The organic Cuticle Care balm is an intensive and super hydrating formula which will give even the most cracked and damaged cuticles, the moisturising TLC that they deserve. Packed full of Shea Butter, Extra Virgin Olive Oil, Castor Oil and Beeswax, you only need to apply a small amount of this thick balm to your cuticles before going to bed, and you'll see a big difference in their overall condition in the morning. It also contains Rosemary extract which helps to encourage strong and healthy nail growth so that's a welcome bonus too! If you have trouble getting to sleep like I do, a product like Badger's Sleep Balm may help. This specialised, all-natural aromatherapy balm has a base of Extra Virgin Olive Oil, Castor Oil and Beeswax, which is infused with pure essential oils of Bergamot, Ginger, Rosemary, Lavender and Balsam Fir. Dabbing a tiny amount onto the pulse points and temples helps to create a relaxing aroma that calms and balances the mind - ah, bliss! It's a handy one to have in your travel bag if you're a nervous flyer as well. Have you tried anything from Badger?